When it comes to eggs, hardboiled means hard work. Messy shells, broken whites and you’ll be peeling all night! Not anymore! 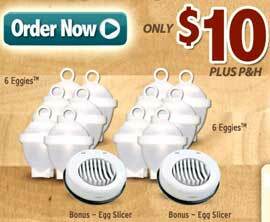 Introducing Eggies, the fast easy way to cook hardboiled eggs without the shells. It’s so easy, simply crack and pour in your egg, boil it right on your stovetop, then just twist it open for a perfect hardboiled eggs¦everytime! Eggies cook your egg just like a real shell, and the non stick interior means the egg slides right out when you are done. Since Eggies unique cooking design cooks the egg flat on the bottom it is now easier than ever to decorate and eat. Enjoy Deviled Eggs without peeling a single shell. Prepare delicious egg salad sandwiches, or simply slice eggs to add to your favorite salads. Peeling a single egg the old fashioned way can take forever, but now you can twist open 6 Eggies Eggs in less than thirty seconds! Also, since you cook without the shell you can even add seasoning or ingredients to your eggs before you boil. There is nothing else like Eggies, order yours today! We’ll DOUBLE the entire offer for FREE, just pay an additional $7.99 P&H. You’ll receive a TOTAL of 12 Eggies and 2 Bonus Egg Slicers!